Make your homemade chili seasoning ahead of time so making chili saves you time! This easy chili seasoning is the perfect blend of cumin, cayenne, chili powder and will add a lot of flavor (without excess sodium) to your homemade chili recipes! 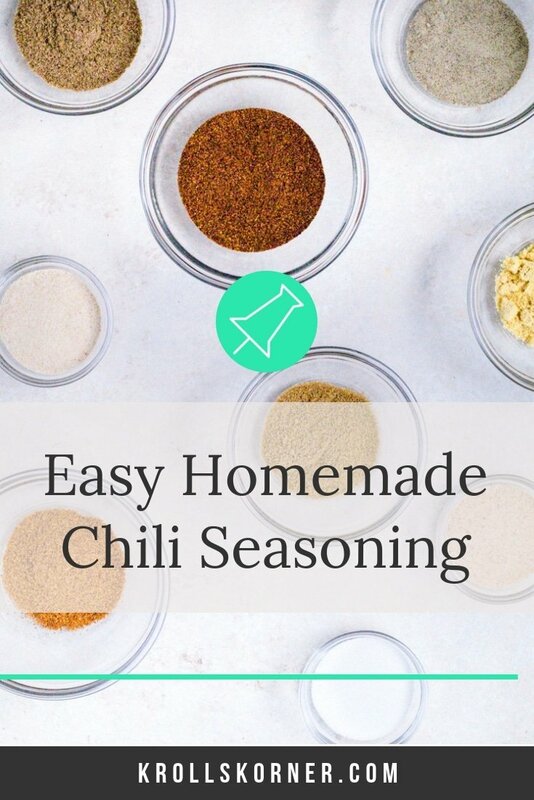 One of my favorite memories is being on our traditional family vacations enjoying homemade chili with this Easy Homemade Chili Seasoning. One of my moms pro tips when we go on our family vacation is to pack seasonings in containers/baggies so she doesn’t have to haul a bunch of different seasonings to the cabin. One of the staple seasonings she’d mix up before we hit the road is this Homemade Chili Seasoning. It makes the prep for the chili that much easier too! 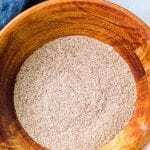 This seasoning recipe makes about 1/2 cup seasoning – and the entire seasoning goes in a chili recipe serving about 12-15 people. (I use the 6 1/2 quart slow cooker from Cuisinart). Be sure to store your seasoning blend in an air tight container – I like to use mason jars – and keep with your other spices until ready to use. What’s in homemade chili seasoning? What else can you use homemade chili seasoning for? I want to point out that just because this is called easy homemade chili seasoning, that doesn’t mean you have to use it for just chili! It can be used to make roasted veggies (would be delicious on cauliflower), on fish, roasted potatoes/fries, lamb or beef, tacos, casseroles and the list goes on! What is the ratio of chili seasoning to meat? 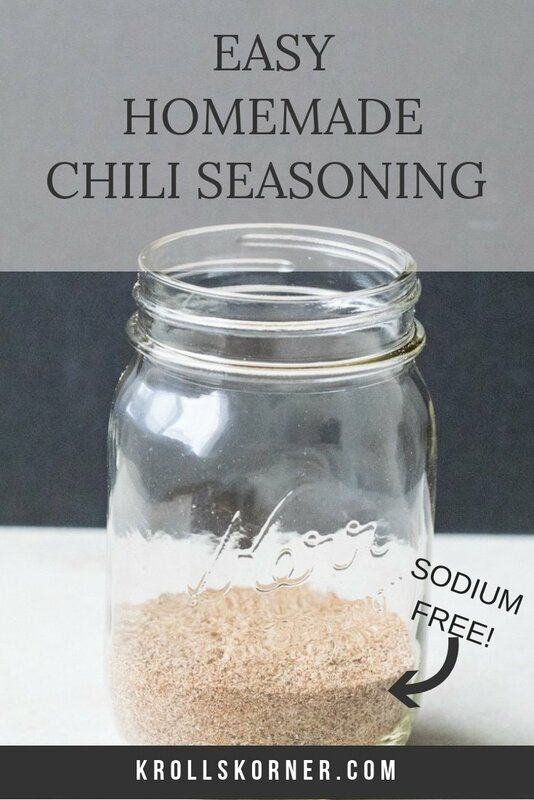 PIN THIS EASY HOMEMADE CHILI SEASONING RECIPE FOR LATER! Prep this homemade chili seasoning for the next time you make chili from scratch! 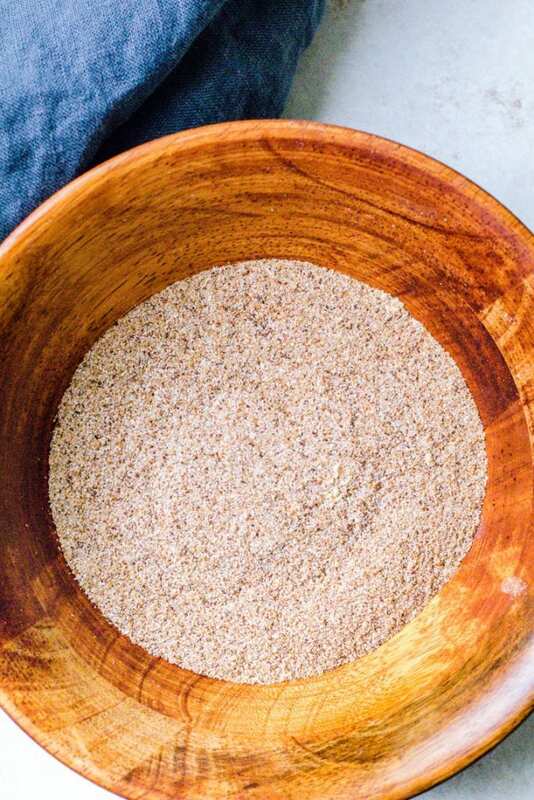 9 simple seasonings you probably already have on hand - and it's sodium free! Mix all ingredients in a bowl. Store in an airtight container until ready to use! Makes ~8 Tbsp. or 1/2 cup of seasoning. Be sure to check your chili seasoning bottle - most have sodium added! Look for salt free! Do you like to make your own seasonings? What other seasonings or sauces do you prefer to make instead of buy?! Let me know in the comments below! This seems so simple and I love how the ingredient list doesn’t have salt! Okay so HELP! I make my own chili seasoning too, but have SUCH a hard time finding plain chili powder! Do you order online?? Totally understand!! My local grocery stores carry salt free – maybe ask next time you go if you can’t find it?! 🙂 Also – AMAZON hooks it up! I am obsessed with making my own spice blends…this is perfect to have on hand for fall!